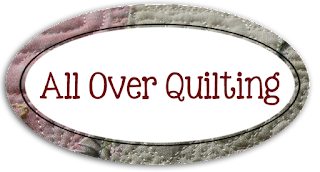 There is something special about stitchery quilts, I'm not sure if it just because I like them or the fact that the stitcheries add a little something to what would normally be a nice quilt. With my trusty favourite threads I went ahead with Denise's instructions of 'please no quilting across the stitcheries'.......Oh as if I could,they are so beautiful. The quilt is lovely Leeanne, I love the texture in it and I also really like the back view, it's almost two quilts in one, certainly something to be treasured by the recipients. Beautiful quilting - and a lovely quilt..
Leanne this is a beautiful quilt and the quilting you have done is gorgeous. You certainly couldn't quilt over the stitcheries I agree. Must be so satisying to see the finished quilt. This has turned out so lovely... with Denise's gorgeous stitcheries and your gorgeous quilting. I bet she is happy with it, and the couple it is for will love it too. So sweet, and I love the colors! 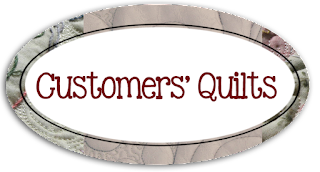 Have you checked out all the quilty links shared over at www.WeAllSew.com yet? I think you would be inspired! Beauitful quilting on this gorgeous quilt. The young couple is sure to be thrilled. Your quilting made the quilt, Leeanne.